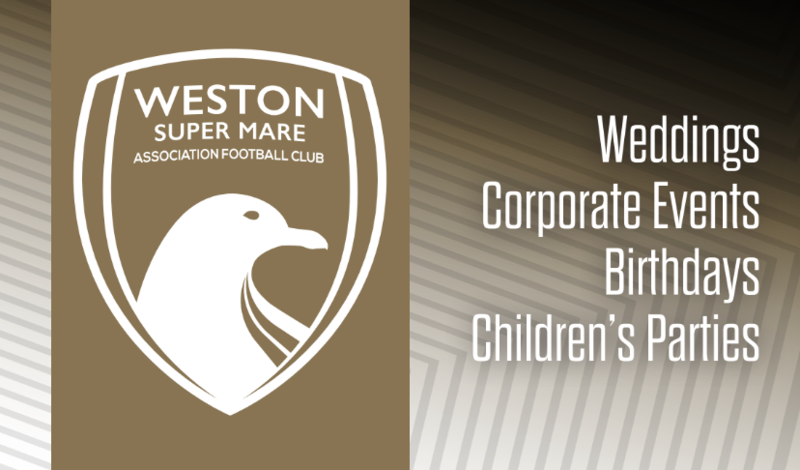 Weston-super-Mare Football Club offer an extensive range of meeting and conference facilities. Our well equipped premises provide an excellent venue for breakfast meetings, conferences and private room hire. The main conference suite is equipped with a PA system with radio microphone and OHP with screen, flip charts, pens, water and cordials can be provided in all rooms. Additional audio-visual equipment can be provided at additional cost. The flagship of our conference facilities. The spacious lounge measures 25m x 12m with a stage for presentations and an adjacent room for storage. When set up as ‘theatre-style’ conference facility it can seat up to 250 people. Other configurations can be achieved by utilising our large selection of round, oblong and square tables in conjunction with the seating. The conference lounge has it’s own well stocked bar and our fully equipped kitchen can provide a wide range of refreshment. We offer a range of packages for children of all ages to give your child a birthday party to remember forever. These packages include: Bouncy castle hire, a foot golf session on a UK FootGolf course, a football session with a qualified Weston-super-Mare AFC academy coach or even a Match Day experience during a first team home match. 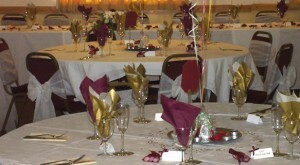 For evening functions the Somerset Suite can be dressed for a formal dinner or less formal party for up to 200 people. The fully equipped kitchen can provided a range of menus. From a light, cold buffet to a full and extensive dinner menu. The well stocked bar is also available. The raised stage is equipped with ample power and has an adjacent charging room. There is also a sizable dance floor in front of the raised stage. This is the ideal venue for small conferences and meetings. The room measures 13m x 5.75m and has an adjoining bar and a small kitchen. Set up for a ‘theatre-style’ conference the room will seat 80 people. If a more formal boardroom style is preferred the facility will provide seating for 50 people. Besides the large conference lounge and the more intimate boardroom we can also offer two smaller seminar or meetings rooms utilising our two skittles alleys. These can be carpeted and furnished to provide comfortable venues for smaller meetings. 20% food deposit required upon booking. PLUS £100.00 returnable deposit (returned the week following the event). Minimum booking requires 10 guests. Please note room hire times differ from above. All of the above is exclusive of VAT which will be added at the current rates if food or additional services are purchased. Buffet menus available at various prices – please contact us for more information. NB – Top/Buffet tables count as 3 tables. All of the above are exclusive of VAT which will be added at current rates. *VAT not added if table cloths only extra to Room Hire. Prices subject to revision please apply to Office for up to date prices.